Our laboratories are located in two buildings of University of Zaragoza: the R&D Building in Campus Río Ebro and the Faculty-of-Sciences Building in Campus Plaza San Francisco. Our most used equipment is described here. The Dual Beam Helios 600 model consists of a 30 kV field-emission scanning electron column and a 30 kV Ga+ Focused Ion Beam (FIB) placed at 52º one from each other. The ion column is able to work properly at low voltage (5 kV and lower), allowing the preparation of lamellae with low ion damage. In this equipment, there are five gas injectors which allow the growth of nano-deposits with high resolution, such as W-based superconducting nano-deposits with lateral size of 40 nm and Co-based ferromagnetic nano-deposits with a lateral size of 30 nm. These ultranarrow dimensions are at the forefront of research in these topics. 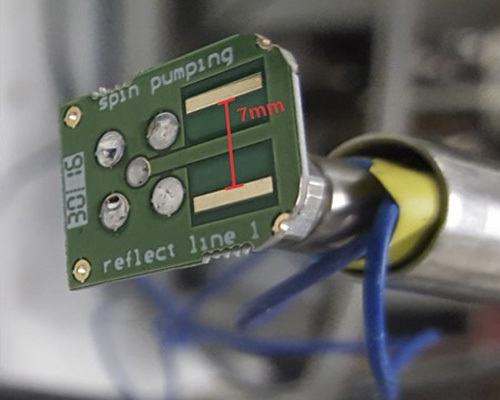 In addition, electrical microprobes (Kleindiek®) could be placed inside the chamber for in-situ electronic transport measurements. Electron Beam Lithography (EBL) is also possible thanks to a Raith® software/hardware (Elphy Plus). The Dual Beam Helios 650 model is an improved version of the Helios 600 one. Thus, the SEM column has resolution of 0.9 nm and it bears a monochromator and beam deceleration. The Ga+-FIB column is differentially vacuum-pumped at the lowest part, allowing a well-defined beam profile impacting on the sample surface. Results with such a column indicate that ultranarrow nano-deposits can be grown. This Focused Ion Beam (FIB) column is nicely suited for lamellae preparation too, in combination with the Omniprobe nanomanipulator. The equipment has got 5 gas injectors and electrical microprobes (Kleindiek®). This cryogenic FIB-SEM equipment is mainly dedicated to analysis of electron-sensitive materials (soft materials) and nanofabrication in cryogenic conditions. The equipment core is based on the Nova Nanolab 200 model from FEI, but upgraded with a cryo-setup (from Quorum) that allows the analysis of materials and nanofabrication at low temperatures (indeed from 100 K up to 320 K). This capability is possible thanks to a cryo-transfer setup and a cryo-chamber with embedded sputtering system. For example, this system permits to in situ generate controlled fractures on quenched soft materials, avoiding the mechanical damage associated with room temperature fractures. In addition to the study of the material in its original state (porosity, embedded nano-objects, internal heterogeneities, etc. ), any internal distribution of materials can be determined by using the Focused Ion Beam (FIB) to produce cross-sectional surfaces. 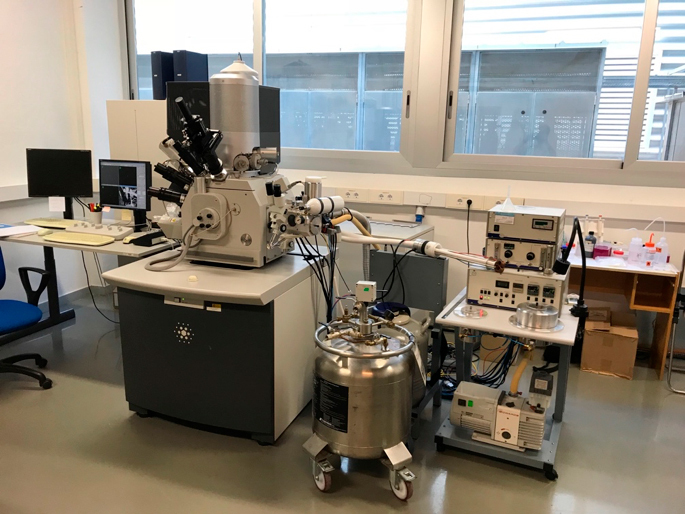 A combined strategy between this equipment and the Helios Dual Beam Model 650 is being conducted to produce series of ion-cuts of biological materials embedded in epoxy. These images are being used to produce three-dimensional (3D) information of material distributions. Appropriate software for compositional analysis based on Energy-Dispersive X-ray micro-analysis (EDX) is also included in this equipment. Additionally, the equipment also holds an Omniprobe nanomanipulator for lamellae preparation as well as 5 gas injectors, allowing nanofabrication and nanomanipulation in cryogenic conditions. 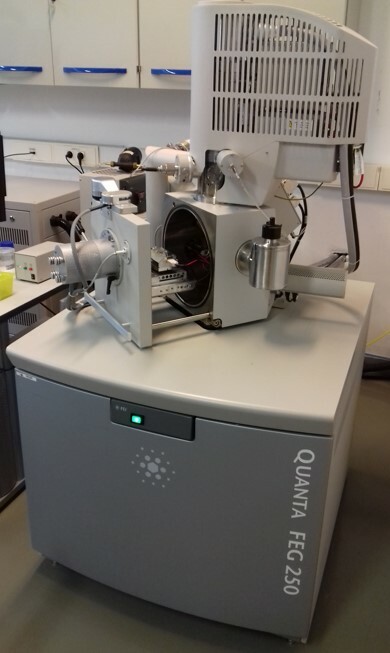 The Quanta FEG-250 SEM equipment is an environmental Scanning Electron Microscope used for high-resolution imaging and composition analysis by energy-dispersive X-ray microanalysis (EDS). The FEG column in Quanta 250 allows beam deceleration, which permits to achieve a resolution of 1.4 nm even at 1 kV electron landing voltage. The Quanta equipment can work under three different pressure ranges, the maximum pressure being 2600 Pa. 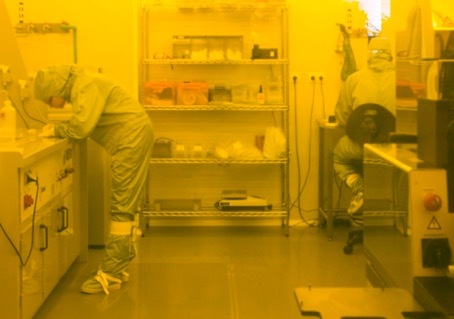 This permits observation of life-sciences samples without previous metallic coating, i.e., studies in environmental conditions (ESEM). This microscope allows the use of a Wet-STEM, which permits to analyze samples with controlled humidity and temperature, which is crucial in life-science samples. 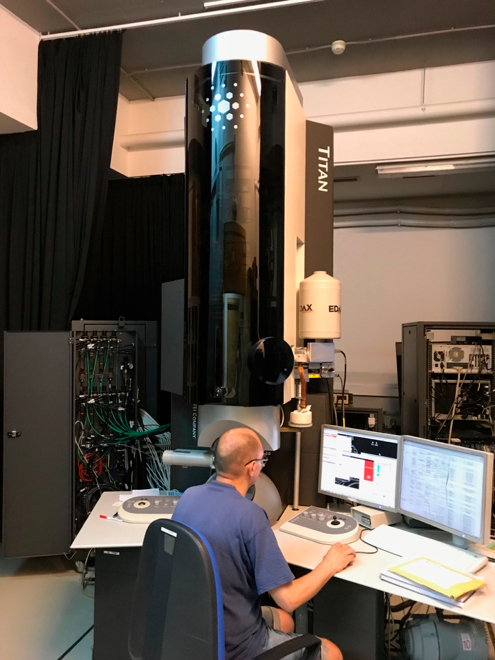 The SEM-Quanta can also use a heater to perform observations on samples heated up to 1000 ºC and detect changes in the morphology of the material, phase transitions and perform annealing experiments. 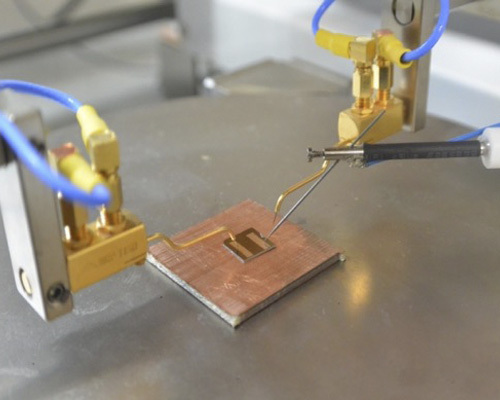 In addition, with this microscope de-acceleration of the electron beam over non-conductive samples can be performed leading to 1.4 nm resolution even at 1 kV. 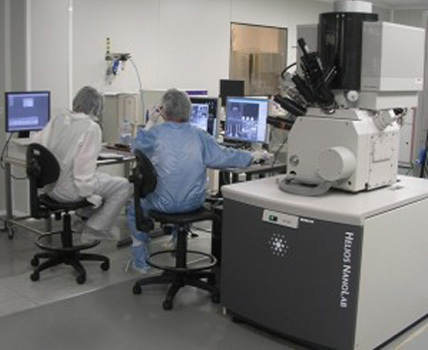 Optical lithography (or Photolithography): in this microfabrication process, a pattern transfer is carried out using masks and photosensitive resists in a series of steps that can be repeated depending on the complexity of the device to be built. 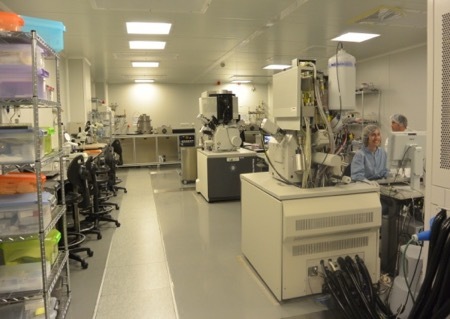 Our equipment in class-100 environment comprises a spin coater, a mask aligner, a chemical booth for resist development and an optical microscope, allowing us to reach one micron resolution. In class-10000 environment, additional equipment consists of an electron-beam evaporator, an etching system (ion beam milling and reactive ion etching), oxygen-plasma systems, a wire bonder and an electrical microprobe station. The Titan Low-base has a spherical aberration corrector (CEOS Company) at the condenser lens, the lens that forms the probe. Consequently, this microscope is appropriate for ultra-high resolution imaging in Scanning-Transmission mode (HRSTEM) and chemical composition mapping with atomic resolution by Electron Energy Loss Spectroscopy (STEM-EELS). This microscope has a monochromator and a High Brightness source (XFEG), which makes it ideal to determine optical properties by low-loss EELS as well as oxidation states studies by core-loss EELS and observation of the fine structure of the energy absorption edges by Energy Loss Near Edge Spectroscopy (ELNES). Several electrical and magnetotransport equipment are available to us. 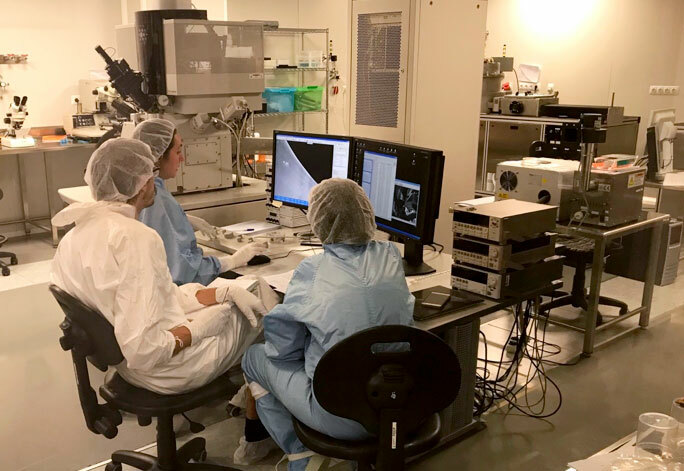 Equipment in the group comprises microprobe stations, a microwave setup for experiments on ferromagnetic resonance and spin pumping and cryostats and electromagnets for standard magnetoresistance and Hall effect measurements. 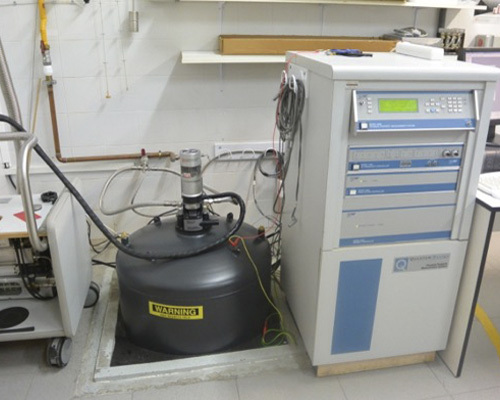 A service at University of Zaragoza provides equipment for magnetotransport measurements under high magnetic field (up to 14 T) and low temperatures (down to 500 mK).